On Saturday March 14th, JDRF held its annual Beach Ball Gala Fundraiser event. This was the second year the event was held at the Bayfront Convention Center. This year, the weather cooperated, and the event was very well attended. As entertainment, the Sheffield High School Steel Drum Band warmed up the crowd during the silent auction cocktail hour, and Tennessee Backporch provided the evening’s musical entertainment in the dining room. 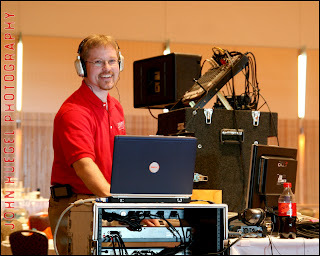 Audiovisual services were once again provided by Chris Britt and his excellent team. Chris was also the recipient of the 2009 Volunteer of the Year award for the Northwest PA chapter. Chris is shown here with some of his gear. Tim and Lisa NeCastro were the hosts of this year’s Gala. A spirited live auction and many other activities created highlights for this memorable evening. I was honored to capture images of this great event, which each year raises tens of thousands of dollars to support research to find a cure for Juvenile Diabetes and its complications.